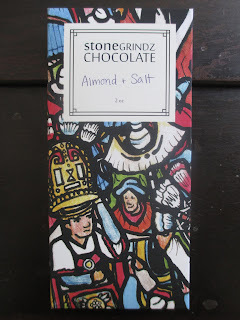 While I've looked at the plain chocolate and even some of the new truffles from Stone Grindz, until now I hadn't yet tried any of their flavored chocolate bars. It was time to remedy that, so I'm starting off with the Almond + Salt bar. Salted almonds is a more standard flavor combination; I thought that would make this flavor a good place to begin. By this point, I've already showed the Stone Grindz packaging and the shape of their chocolate bars. The only difference here is that you can see some of the almonds peeking out of the surface of the bar; on the back, there are even more almonds, including a couple of big pieces. For any bar with this amount of crunchy elements, even when it's dark chocolate like this, it's more of the type of chocolate that you bite into and chew--no slow melting in this context. As such, you get the almonds and salt together at once, along with the chocolate that holds them together. The three work as a team in which the chocolate is the sweet element (despite being dark chocolate that doesn't taste particularly "sweet" when you taste it on its own), a warm and red little cushion for the other two elements. The almonds are the earthy element, coming in with their familiar flavor and that singular type of crunch. The salt is the tangy, lively element; it makes everything sparkle. There is just the right amount of it, as well: enough that you can noticeably taste it but not, you know, to the level of tortilla chip saltiness. Stone Grindz is interesting to me because they have a particular combination of earthiness and sleekness to their style. As I try and place the style of this bar in my head, I come up caught between two places. On the one hand, almonds and salt can make for a casual chocolate bar, something that you might think of as more of a snacking chocolate, something you might even take with you on a hike. But then the chocolate has a taste of elegance. Sometimes with flavored bars, the chocolate has little flavor of its own; but here it's rich and warm even though you're eating through it so quickly. I suppose then that the fact of it is this: here is a good chocolate bar with the right balance of three flavor elements. Wherever or whenever you want to eat salted almond chocolate, it's ready for you.